The Population Study of ChINese Elderly in Chicago Study, or The PINE Study, is a collaborative effort between the Chinese Health, Aging, and Policy Program (CHAP) at Rutgers University, Northwestern University and several community services organizations, including Chinese American Service League, Midwest Asian Health Association (MAHA) and Xilin Asian Community Center as the main community partners. 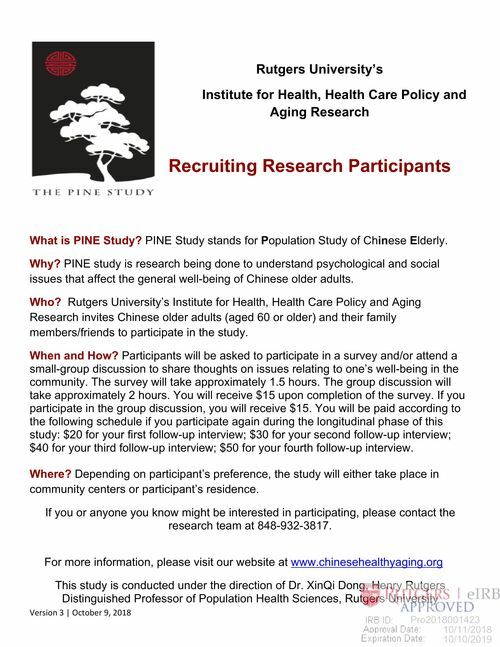 The PINE Study is an extensive study that examines the general health and quality of life of Chinese elderly in the greater Chicago area. To our knowledge, it is the largest cohort of Chinese elderly ever assembled for epidemiological research in Western countries. Between 2011 and 2013, 3,157 face-to-face interviews were conducted with elderly living in the community, ages ranging from 60 to 105.  By shedding light on the health and well-being of Chicago Chinese older adults, the goal is to improve the health and quality of life of the Chinese aging population through education, research, advocacy, policy and sustainable community engagement in the Greater Chicago Area and beyond. Chinese elderly older than 60 in the greater Chicago area were invited to participate in the study. Participants have been contacted in community settings, such as community-based organizations, social services agencies, churches, educational and outreach activities, senior apartments, newsletters and advertisements in community centers, and also by word of mouth. Multicultural and multilingual interviewers were trained to conduct in-home interviews face-to-face with participants in the language or dialect they are more comfortable with, which are predominantly Cantonese, Taishanese, English, Mandarin and Teochew dialects. During the 2011-2013 period, over 3,000 interviews were conducted. Questions were selected from scales that were validated in social science and public health research, translated into Chinese (if Chinese version was not available) and translated it back to English. The survey questionnaires were further inspected by investigator to ensure content and validity. Data were then collected using state-of-science web-based programthat recorded in English, Chinese traditional and simplified characters. This technological platform minimized any information that may be "lost in translation", increasing of the data collected. Data collected from the PINE Study shows that there are many concerns with health disparity issues that are found in this rapidly expanding aging US community. At present, there are very few services that cater to the need of Chinese older adults and their families, with a lack workforce able to provide appropriate care, taking into consideration their linguistic and cultural needs. This demonstrates the need for increased social and health care services in the interest of this vulnerable population. A multi-disciplinary partnership is sought to provide them with a much needed disease prevention, intervention and support strategies for successful aging. 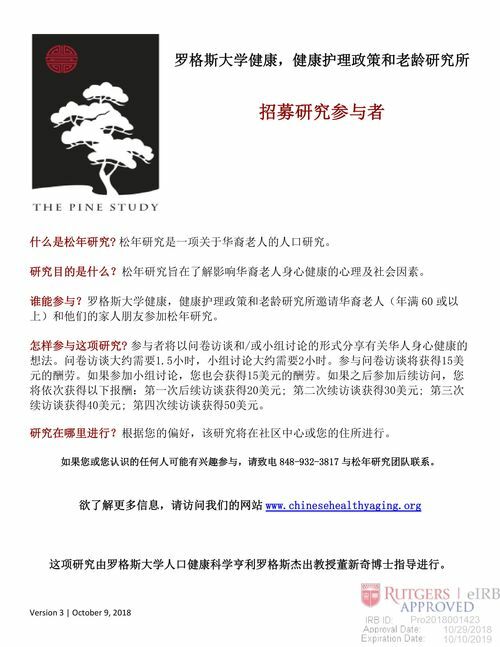 If you are interested in participating the PINE study, please check our flyers and contact us by E-mail or phone: (312)736-2199 (English and Mandarin) / (312)736-2178 (Cantonese). For more details about The PINE Study, please check our Wikipedia page .